This 1450 PSI, 120 volt electric pressure washer from Cam Spray is one of the most economical models we have to offer from our full line of electric cart mounted power washers. However, don't let the low price fool you, because this machine is still a full on industrial pressure washer that will last for years of everyday use. The only unit that is more economical, is our 1000 PSI cart mounted pressure washer. Both of these models are mounted on carts, come with a 120 volt electric motor, and supply 2 gallons per minute. All in all they are very similar, but this model supplies 1450 PSI with a 2 horsepower motor. When using this 120 volt electric pressure washer, it will pull 20 amps when run under a full load, so we recommend having a fully dedicated 20 amp circuit available when using this machine. If you are using it in a residential setting, most bathroom outlets are wired with a 20 amp circuit. 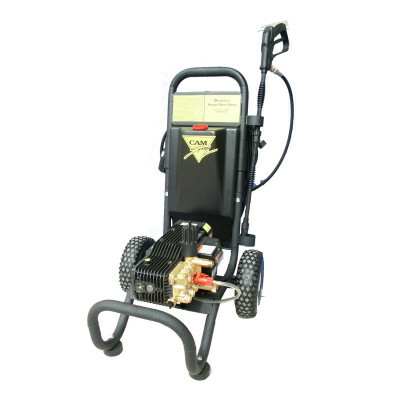 Customers who were interested in the Cam Spray 120 Volt Cart Mounted Electric Pressure Washer - 1450 PSI were also interested in the following items. This is a review for the Cam Spray 120 Volt Cart Mounted Electric Pressure Washer - 1450 PSI.